Will Kinney is a professor in the Department of Physics at the University at Buffalo, SUNY, where he has been on faculty since 2003. Dr. Kinney received his Bachelor of Arts from Princeton University, and PhD from the University of Colorado, Boulder. He has worked as a research associate at Fermi National Accelerator Laboratory, the University of Florida, and Columbia University, and held visiting positions at Yale University, Perimeter Institute for Theoretical Physics, Harish Chandra Research Institute, Allahabad, the University of Chicago, the University of Valencia, and Stockholm University. 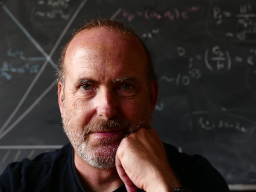 Dr. Kinney's research focuses on the physics of the very early universe, including inflationary cosmology, the Cosmic Microwave Background, Dark Matter, and Dark Energy. He has authored more than sixty published research articles, and received the SUNY Chancellor's award for excellence in teaching in 2014. 2018 - 2019: Visiting Professor, Oskar Klein Centre, Stockholm University, Stockholm, Sweden.